This small USB device acts as a small two port USB hub. However one of the key features of it is that it has a digital display that shows the voltage and current of connected devices. When first plugging it into a USB port or charger it will only show the voltage. The current should be at 0. This is because until you plug in something on the output ports there will be no load. 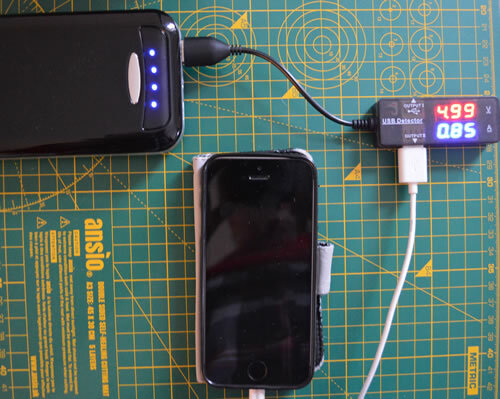 The recommendation is that this can test the voltage and current from USB chargers, battery pack charger and computer USB ports. The initial test was plugging the multimeter into a laptop USB port. The initial state, as shown in the above picture, shows that it is reporting 5.08 volts from the port. This is an acceptable voltage for a USB port as this should be near 5 volts. Once I had tested the multimeter without a load I attached an iPhone SE to one of the output ports. This is shown below. 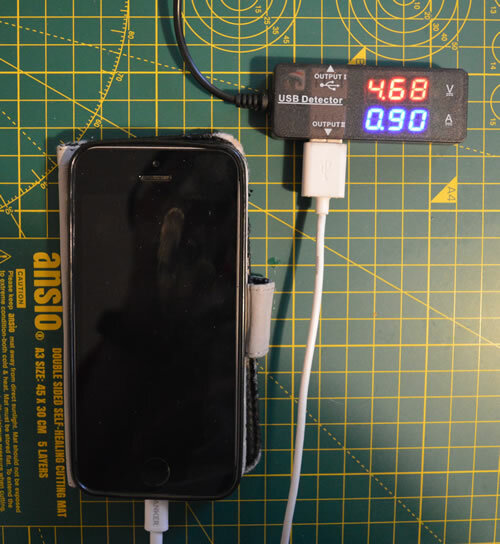 Charging an iPhone SE attached to the multimeter from a computer. Here we can see that after attaching the phone the current measures 0.90 amps. It is also important to note that the voltage has dropped. This can occur when a high load is placed on a device. A USB port was not designed to deliver a large current needed for charging phones. This then can cause the voltage to drop. The Drop is not significant to cause issues and therefore isn’t an issue. However this is something that needs to be kept in mind when connecting high load devices. In comparison in the below picture I have attached the iPhone to an external battery pack. Charging an iPhone SE attached to the multimeter from an external battery pack. The charger, unlike the USB port on the computer, is designed to provide a high current to charge mobile devices. This shows that is able to deliver a good 4.99 Volts at the 0.85 amps that the phone requires to charge. 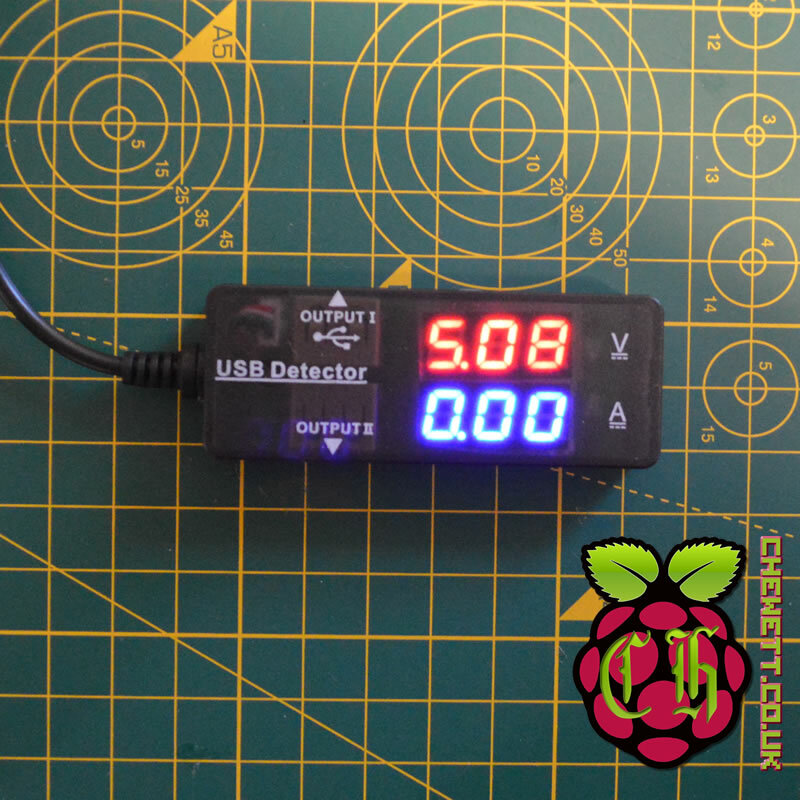 As a cheap multimeter to test the amount of current a USB device pulls it is very useful. This can also be useful in situations where you want to check that the voltage isn’t being pulled too low by a high current. In addition, the two output ports are quite useful to test the load of multiple devices. Overall as a simple multimeter for USB devices this works pretty well and I would buy it again! This product is available for purchase at Amazon.